A detainee said to have been on suicide watch has died while awaiting deportation. The death of a Jewish detainee at Colnbrook immigration removal center near Heathrow, in south west London, has been confirmed. Amir Siman-Tov, thought to be in his thirties and of Moroccan origin, died in the early hours of Wednesday. The cause of death is unknown. Detainees, both men and women, are held there after it is decided they cannot remain in the UK, staying at the center for uncertain lengths of time until they can be shipped out of Britain. A fellow detainee, Adel Kader, 50, from Lebanon, told the Guardian that Siman-Tov had been on suicide watch when he was found dead in his room. “He was put into healthcare as soon as he arrived here a few weeks ago, I got to know him. There is a little kitchenette here and we would make tea and coffee. He had a nurse with him all the time. He was on suicide watch,” said Kader. Kader added that Siman-Tov was “a quiet and intelligent person” and “a very gentle man." “Our thoughts go out to the man’s family and loved ones. This tragic incident once again highlights the lethal policy of indefinite detention. This is the 25th death in an immigration detention center in the UK. The evidence that detention is harmful is indisputable,” said Mia Hasenson-Gross, director of Jewish human rights group René Cassin. 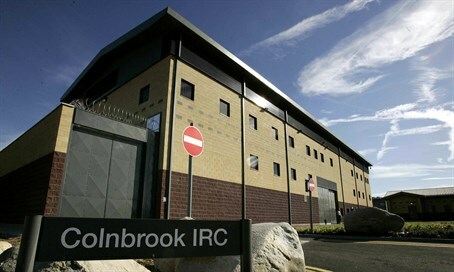 “Over 400 migrants, mainly men, are held indefinitely at Colnbrook Detention Centre. The fact that this man is Jewish connects to our community, but this is a policy that affects over 30,000 migrants who are held indefinitely every year in the UK,” said Hasenson-Gross.